Fresh the movie was awesome!! A little more serious than Food, Inc, but just as powerful. I highly recommend watching it if you can find a screening in your area. And hopefully it will be out on DVD soon. I took this awesome Vega bar to munch on. Love these soooo much!! It’s funny how both Vega and Amazing Grass bars have really grown on me. I think when my samples are all gone I will be buying more of both! 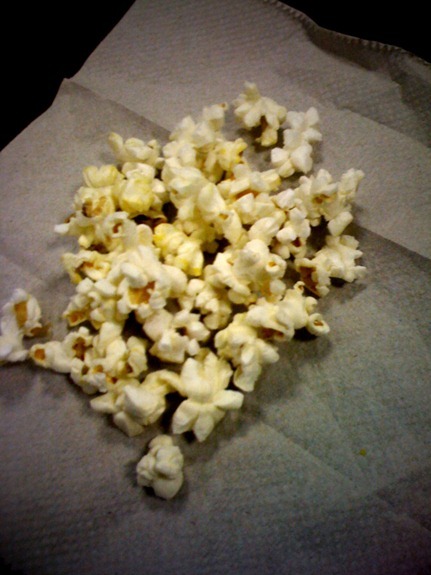 I also shared a little popcorn with my neighbor! I quickly came home after the movie to find dinner almost ready by Matt!! I scrambled to make my lunch (and photograph and blog my lunch!!!) while he put the finishing touches on plates. That would be The Great Organic Grass-Fed Uncured Hot Dog! See this post for the info when I got the package of samples. I froze the last 3 and am happy to say they reheated nicely. If you ever get a hot dog craving, these are your dogs. Served with a pile of roasted brussels sprouts!! Yuuuuuuuuum! Matt poured himself a glass of milk with dinner (which we rarely do but he’s going out of town and we have a lot of milk) so I decided to have a half glass as well. Hot dogs and milk. Just like being a kid again! Lately I’ve been getting in bed to ready in the early 8:00 hour and I’ve been loving it!! Evenings used to feel so rushed for me to get in bed and now that I’m getting up at 5 again, I’m going to bed when Matt does and it makes for such a peaceful wind-down to my day. Happy. I almost got brussels the other day at TJs but had to put them back because I have too many veggies to eat. Made me sad! 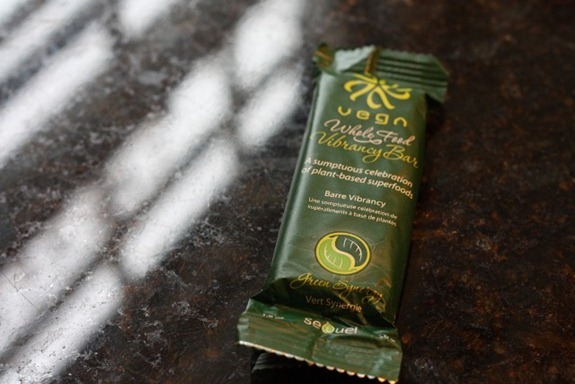 I am really curious about the Vega bars… specially now that I am training for my ride! I love brussel sprouts! Does anyone know what happened to Jenna’s blog, eatliverun? When I try to go to it I get an error? I love those hot dogs, too! 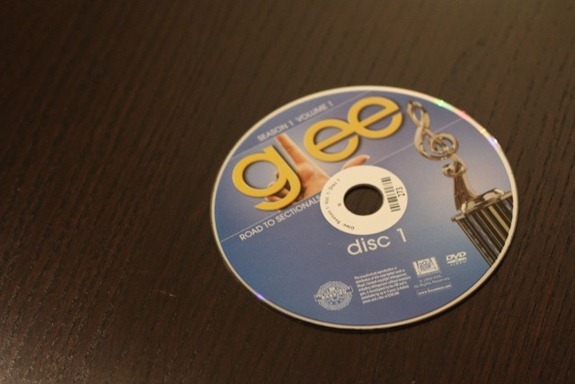 I haven’t seen Glee, yet (I know I live under a rock) but I heard it’s great! 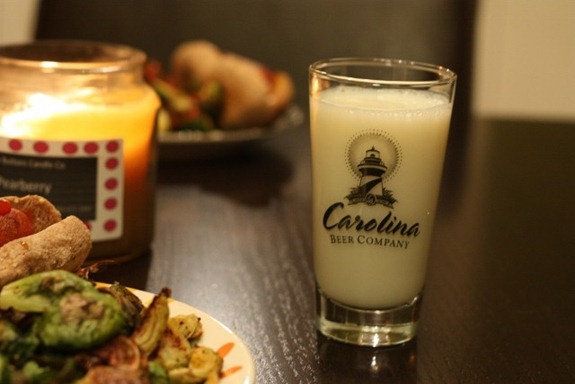 I love that you both had a glass of milk with dinner! Stick with Glee!!! Some of the episodes are just ok….but the good episodes are out of this world good! 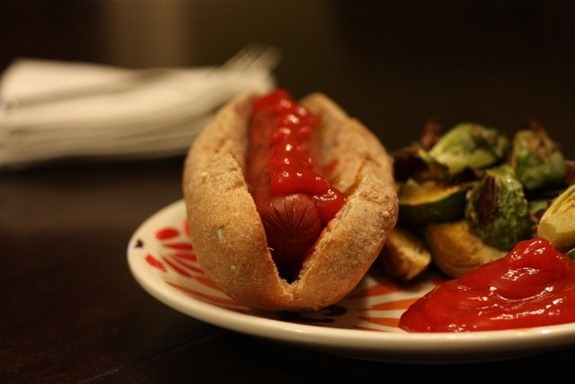 ps…your Chicago readers are appalled at the ketchup on your hotdog!! Lol! What do you put on it!? Chicago hot dogs: mustard, celery salt, onions, relish, pickle spears, tomato, sport peppers….but never, ever ketchup! Chicago peeps get crazy bout their hot dog toppings…after all we have 2 baseball teams in town. For sure, all of what she said. Absolutely not ketchup! Those hotdogs sound so eco friendly! I miss hot dogs! I can’t bring myself to eat them anymore…now that I’ve wised up to the ingredients. I think Glee is ok. So many people have recommended it to me….Maybe I just had too high of expectations? I love anything covered in ketchup. Seriously. 8pm? When do you have dinner? Just curious. I want to see Fresh, glad you got to view it! It must be nice to get a full night’s rest when you are waking up as early as you do, good for you! Glee will grow on you! It’s not my “style” at all, but I love it!! The first few episodes of Glee aren’t the best, but after a while, it starts getting REALLY good and really hits its stride. I love it! Glee has to be my new favorite show in a long time! The singing/dancing is so fun and the story line gets better, promise 🙂 Hope you have a good evening! Were those buns from Great Harvest? And ketchup, I love Ketchup so much. I don’t really ever want to hot dogs because of the crap but those look interesting. Some days you just want to be a kid again. yay popcorn! those bars sound interesting, i have been meaning to pick one up but i have declared a moratorium on bar-buying bc i go overboard! i LOVE glee! Wow, I haven’t had an urge to eat a hot dog in forever but that looks pretty decent! Can’t wait for Fresh on DVD either; there aren’t any screenings within 100 miles of me! ps. omygosh YUM to all of your food! What’s Fresh about (in a nutshell)? Hot dogs, milk, glee…. so joyous! Have fun! I know they’re better different than ballpark franks, but I just thought it was ironic/funny! I do like the Amazing Grass bars too. So delicious! I LOVE Glee, can’t wait for it to come back on in April! Now I am craving hot dogs! I will have to try that brand! That looks like such a childhood comfort food donner. Loooooooooooove roasted brussels, so yummy! I REALLY like those GH hot dog buns, those rock! I like rolls better than loaves for portion control. 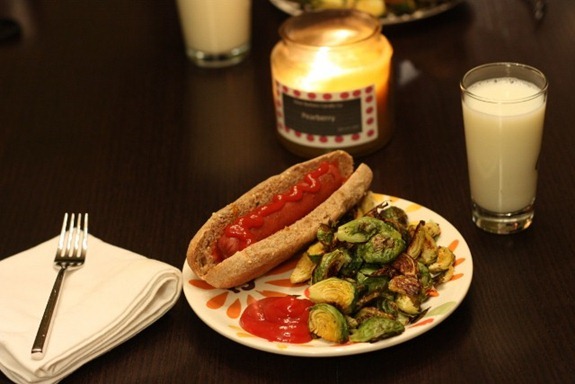 hot dogs and milk – love it!!! I LOVE hotdogs. I think they are gross, but I love them. 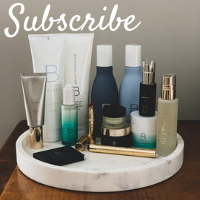 Just started following your blog and really love it and your photos! I was wondering why you guys stray away from glasses of milk? No reason in particular. I just prefer to chew my calories. You will love Glee! The episodes only get better after the first one. 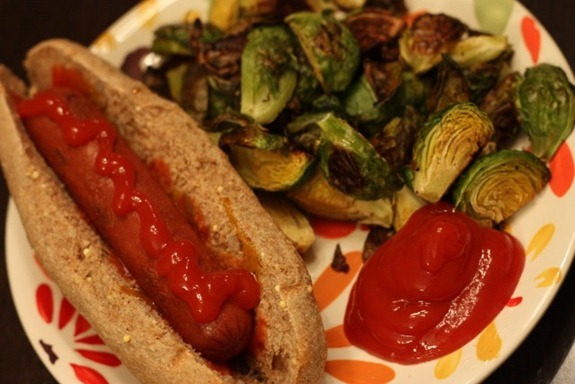 I LOVE hot dogs so I’ll definitely try this healthy alternative!!! Makes me want one right now!! I cannot WAIT until brissel sprouts come back into season over here – LOVE THEM! Thanks for the Fresh recommendation… I’ll definitely have to check it out. And those hot dogs do look great! KID SISTER!?? Like that big blond doll?! I had her! And my brother had the boy. I forget his name.. I haven’t had a hot dog in ages! Hey Kath, shout out for TX readers: HEB Central Market (which you can find in most HEB stores) has an uncured organic beef hot dog that is really good! They’re right along with the Applegate Farms in the “hot dog” section and for a little less $. I get to see FRESH in about two weeks! I am excited 🙂 I loved today’s posts btw!! Oooh… that hot dog looks so delicious. 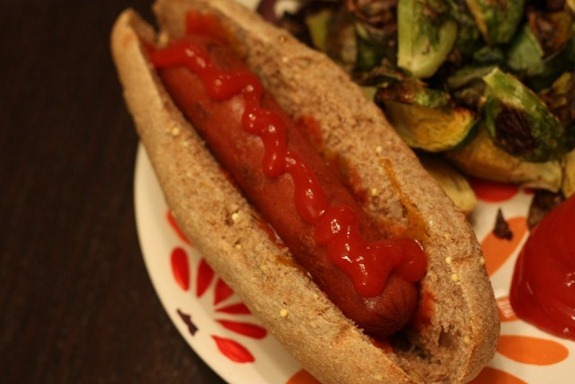 My hubby gave up eating ALL hot dogs years ago and cannot be convinced that some are okay. Thanks for the link to the info. I’ll see if I can get him to give in! I’ve never tried the Vega bars. They sound interesting. Glad you enjoyed the move – I haven’t seen it yet. Looking forward to it, though. I love roasted brussel sprouts! I’ve been eating them so much lately! Honestly.. I’m not really a hot dog person. I know you can read the ingredients and realize its a different product but I have some strange associations there… haha… and I’m also shocked you aren’t obsessed with Glee! Give it some time – the show ROCKS! I totally feel the same way without Glee. I mean, I love it, but mostly for the music. If it didn’t have the singing it would be kinda “eh” but it does…so it’s awesome!! I haven’t had a hot dog in years! That looks awesome! Oh I’ve been listening to the music for months now!! LOVE it! Dinner looks so tasty. I love [tofu] dog nights! What type of buns are those? They look super hearty. GH? Bed at 8, wow! 4 hous earlier than I get to bed haha!! I’m pretty sure I know every Disney song by heart – and I love glee! Also envious of your roasted brussel sprouts – I’ve been eating a packet raw almost daily for the past month. Necessity breeds invention, or non-invention, I guess! I’m an early bird too, so much so that if I even stay up past 9 or 10, i miss my “window of opportunity” and end up not being able to sleep at all. I haven’t even heard of “Fresh.” Thank you for the recommendation! I still need to get around to seeing “Food, Inc.” Perhaps a back-to-back screening is in my future…. I love your kid-like dinner. While I rarely eat them, I do like a good old hot dog every now and then. Usually in July, while at a rooftop BBQ in Brooklyn. I had never heard of Fresh…. how come Chicago never gets any of the good ones? When Food Inc. was out it was in ONE THEATRE in the whole city of Chicago, crazy! how amazing is glee??? I can’t wait for the 2nd disc comes out! I haven’t made my own brussel sprouts..the first time I tried them was back in November, which I can’t believe. I like them but haven’t experimented with them myself, but yours look delish! it all looks great, except the bun! would rather have no bun than a whole wheat one on a hot dog. sorry…do eat ww bread, but that bun just doesnt go w a dog! I would go to bed at 8 every single night if I could. I’m such a big go to bed early/rise early type of person. My college friends just can’t fathom it! Glee will grow on you! The first few episodes, I was like “What the heck?” but now I am a huge fan. Now you have me curious about “Fresh” I am going to have to see if it is showing anywhere in my area. Thanks! I can’t wait to see Fresh! These movies, like Food Inc., are so eye opening! Everyone should HAVE to see these movies. Big changes need to happen. I will look into those hot dogs. I LOVE hot dogs but not since my eating habits have dramatically changed, now I cringe looking at the ingredients. We found a pretty great natural hot dog in our local market. I’m getting to the point where I choose to not eat meat, unless I know it’s raised organically or at the very least grass-fed with no hormones or anything artificial added to it! Like everyone else says…. stick with Glee – it took me a while to get into it and its a bit slow at first but gets really good…. Haven’t even heard of Fresh but it sounds good – hope we get it in the UK. ps just wanted to let you know that you got me to try roasted brussel sprouts and am now ADDICTED! 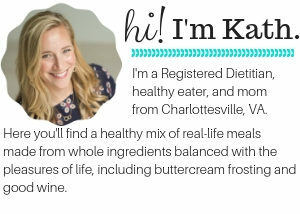 (and kale chips too!) – would never have thought of it, so thanks! I love kid food nights! They are so much fun! As for GLEE, I was the same way when I saw it. I took dance for years (loved it) and I sang in chorus. I loved the singing part of glee but was not blown away by the characters. I watched more and they do get more established and it becomes kind of addictive. My friends loved the show and I did not get it…now I do. I’ll have to get my hands on some of those dogs! My husband is a hot dog fanatic. Yummy looking dog! Glee is a really happy kind of show. Sorta corny, but you feel all warm and fuzzy watching it.!! I like it! 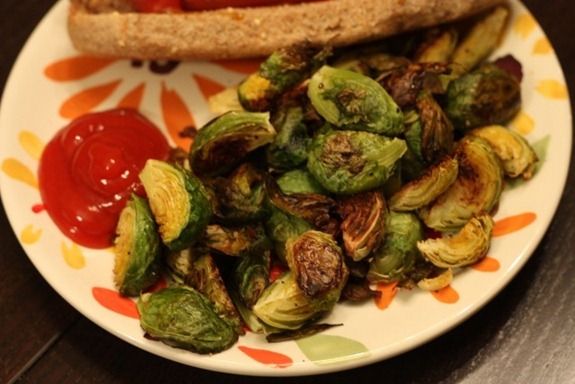 Roasted brussel sprouts are one of my favorite things in the world –yum! It looks like he did a great job cooking them! I love Glee too! In reality, its not very good, completely cheesy, and the story lines are unreal, but it is positively addicting! Those hot dogs look awesome! I checked out the site and the nutrition info rocks! I hope you become as addicted to Glee as hubby & I are. It really is one of the most entertaining and funny shows I have seen in a long time! I love roasted brussels sprouts! And hot dogs are great in the summer, though I try to buy turkey dogs when I can. I love Glee! It took me a few episodes to get into it, but I’m glad I kept watching. I can’t wait for it to come back on the air! I recently saw Fresh the movie in my Holistics class…loved it! I cannot wait for it to come out on DVD so that I can share it with everyone I know! I am usually not a huge fan of hot dogs (mostly because of their ingredients) I will have to check these out! Yeah, the Vega bars are pretty cool. Not as good as roasted b sprouts, though!